A photograph of the Kansas Photographers' Club. 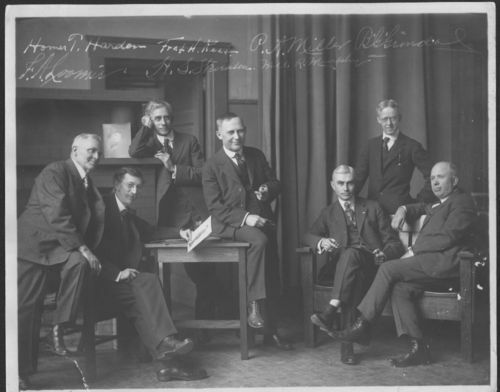 Members are: Brar Gustaf Grondal, who owned a photography studio in Lindsborg, Kansas, (far left), Fred A. Loomis, Emporia, Kansas, (second from left), Homer T. Harden, Wichita, Kansas, Fred H. Reed, Wichita, Kansas, P. A. Miller, H. S. Stevenson, Leavenworth, Kansas, and Will R. Murphy, Newton, Kansas. The Club met annually with each photographer taking a turn hosting the event.